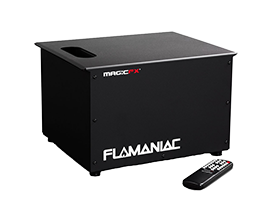 Flamaniacs are a 5 finger liquid flame system, each flame jet is around 6m, Using DMX you can create chases across the unit or across multiple units. Flamaniacs are a 5 finger liquid flame system, which can be used in and outdoors to create a jaw dropping effect. Using DMX you can create chases across the unit or across multiple units. The Flamaniacs are available in 4 colours, red, green, yellow & orange flame. Each liquid flame jet spans 5m on each point.